Elise Faux Eyelashes #100 are black lashes with a criss-cross design, accented with gold sparkles on the lash band. 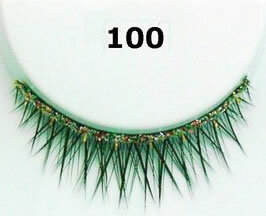 This style is similar to Elise Faux Eyelashes #099 and Shu Uemura False Eyelashes Dazzling Diamante. My BF just loved the look of these lashes and the sparkle. They were easy to put on and take off and stayed in place all night. Great purchase, Stayed on all night and looked fantastic! feel like a star when i have this elise lashes on! rock on!